are not close to tassel. The wet weather and calendar increase the urge to get back into the fields earlier. Getting into the field "one day too soon" can result in sidewall compaction and/or surface compaction that will put the corn crop further behind all season. Below are some images that serve as reminders of what happens when fields are planted too wet. 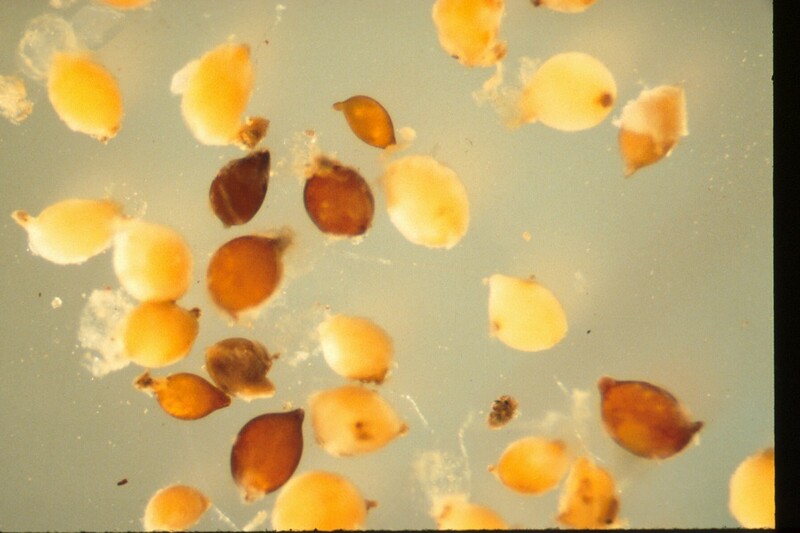 Soybean cyst nematode (SCN) is the most widespread and damaging disease pest of soybean in Kentucky. It is my opinion that SCN is the main cause of the so-called, “yield ceiling” that is evident in many Kentucky soybean fields. Corn planting is a little behind in 2013, but that does not mean that we will have low yields. Corn planting was behind in 2011 and 2009, but overall statewide average yields were excellent both years. Corn planting was way ahead in 2012 and overall state yields were some of the worst in recent history. 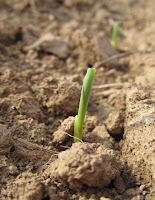 An excellent article was written about the planting date conundrum in Indiana. Here in Kentucky, we see a similar conundrum. Recently, I asked producers across the state to send me planting date and corn yield data from their operations. They sent me corn planting dates and yields from 2003 through 2012 (Figure 1). The data would indicate that the best planting dates for Kentucky would be from about the last week of April through the third week in May. Who is going to believe that?! 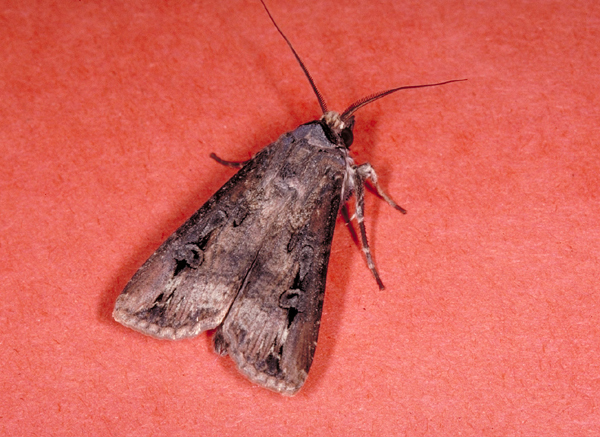 Capture of both armyworm and cutworm moths have decreased during the previous trap week. At present the data indicate that neither pest is set for a big outbreak. Of course this can change especially if we get a sustained week of good weather. This does not mean that there are no pests around, there certainly are. Nevertheless, flight patterns compared to the rolling five year average do not show any sign of an elevated risk of outbreak. 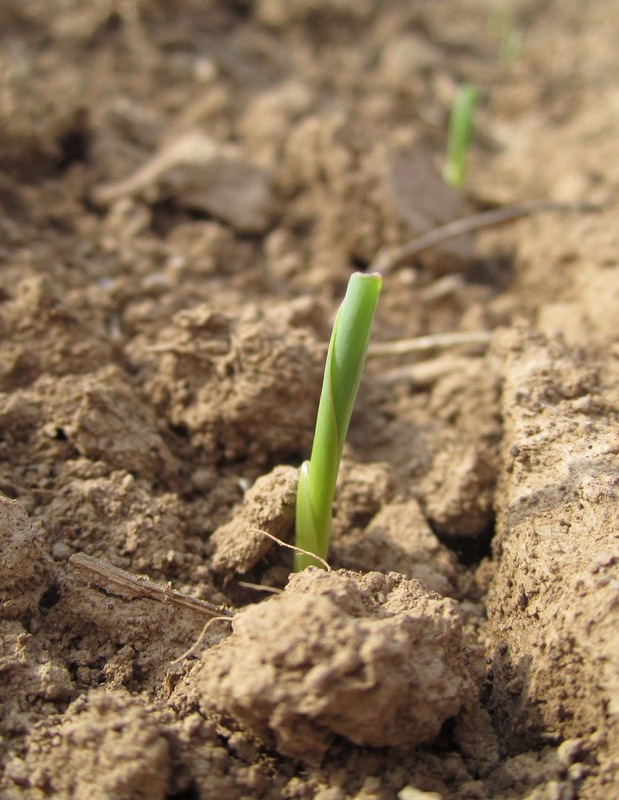 Even though we have a good outlook for the short term we still need to remember that “only about 15 percent of corn has been planted which is well behind last year’s 73 percent and the five year average of 32 percent” (KY Weekly Crop & Weather Report Apr. 22, 2013). Remember, both black cutworm and armyworm are migrating to KY from more southern states, and the timing of their migrations are dependent upon temperature just as are planting and corn development. So it is still very possible that larger populations of either or both of these pests could show up in the early vegetative stages of corn development.So, for the moment things look good, but one best pay attention to future developments. Tracking moth flights isn’t your only preparation option. With both insects but black cutworm in particular providing a weed free seed bed for at least two weeks prior to planting can make a big difference. Early preplant herbicide programs have shown a positive impact in the prevention of cutworm and common stalk borer infestations. Removing weeds especially grass weeds by whatever mechanism, ahead of planning is a good strategy for these early arriving insects. 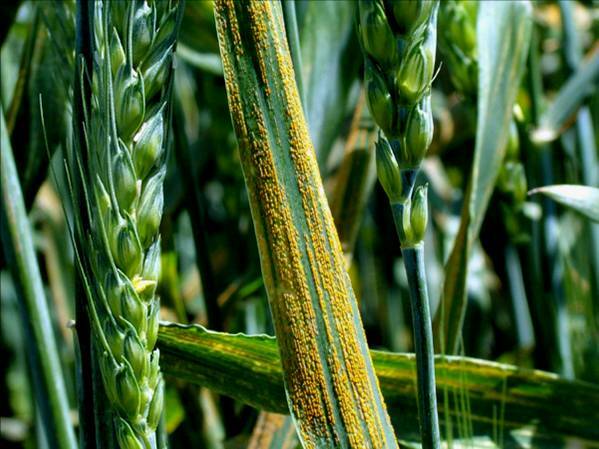 Although there have not been any reports about finding stripe rust in Kentucky wheat, the disease is present in Arkansas, Louisiana, Mississippi, and Tennessee. Last night, a storm system rolled through west Kentucky from south to north, and stripe rust spores likely moved into the state. The cool weather will support infection, since the disease likes cool weather. This situation is not cause for great alarm, primarily because temperatures should warm pretty quicky and this will slow further development. Still, some fields might be at risk and it is, therefore, a good idea to scout your wheat throughout the heading period to discern if a rust-targeted fungicide spray is needed. If you choose not to scout and wait until early flowering to apply a fungicide targeting Head Scab, stripe rust may not be adequately controlled. This is really just a "heads up"; NOT a call to general action. So far, wheat diseases are pretty minimal in KY. In Kentucky, armyworm can be an important pest of corn and wheat. Corn products that contain a Bt trait that provides protection from caterpillar feeding (See: Insecticide recommendations for corn: http://pest.ca.uky.edu/EXT/Recs/ENT16-Field%20corn.pdf, pages 6-7) will likely be protected. However, non-Bt types including field corn refuge, popcorn, food-grade corns, and sweetcorn along with wheat will be at risk. We are several weeks from any damage caused by armyworm as the adult moth is not the damaging stage. Monitoring this stage just gives us a “biofix” or heads-up that the pest is about. It is the caterpillar in which we are interested. You may want to check the flight graphs each week for the progress in this population. These may be found at: http://www.uky.edu/Ag/IPM/ipm.htm. It only takes a few seconds to check and this can give you an idea of the relative risk of this pest for this season. On the graph you can see displayed the current year’s capture (green), the rolling five-year average (blue), and known populations that have resulted in outbreaks (red and/or black) This will give you a rough estimate of the current year’s relative risk. As these graphs represent moth flight, the relative population size can be seen before the damaging stage, the caterpillar, develops. If populations appear to be indicating an elevated risk, I will use a temperature-based model to predict when the caterpillar stage will appear. This model will NOT predict which fields will be infested. One must scout fields to know if the armyworm is present, but the model will provide an estimate of when the field should be scouted. Remember, the model predictions will be based on the capture and temperatures at the UK-REC in Princeton (Caldwell Co.) KY. In areas to the south and southwest of the UK-REC caterpillar development will be ahead and areas to the north and northeast of the UK-REC will be a bit behind. I will post, and you may review, the results of these model runs each week in this publication. So, if you are the pest manager for wheat or corn this spring, keep yourself tuned to this outlet for “Early Warnings” about this pest. A new wheat fungicide efficacy chart is available for producers and crop consultants as wheat fields are scouted this spring. The North Central Regional Committee on Management of Small Grains Diseases, which includes Dr. Don Hershman, compiled the data based on field research across the region. All efficacy values are based on labeled rates of each product. Diseases listed on the chart include Powdery Mildew, Stripe Rust, Head Scab and others. A list of the more common wheat diseases in Kentucky can be accessed here. Products in the chart include strobilurins, triazoles and mixes of both. Products are listed by the active ingredients and the most common product name. Efficacy ratings range from "E' or excellent to "NR" for not recommended and "NL" for not labeled. The table also includes harvest restrictions. If you have questions about fungicides, fungicide efficacy or wheat diseases, contact your county extension office. Hot, dry conditions last spring resulted in almost no Fusarium Head Blight (FHB) occurring in Kentucky’s wheat crop. It is anyone’s guess how severe FHB will be this year, but the time will soon be upon us to decide if spraying a fungicide for FHB (and deoxynivalenol [DON] in grain) is necessary. As a result, I just wanted to bring your attention to the recently revamped FHB Prediction Center and Risk Assessment Tool webpage (http://www.wheatscab.psu.edu/). Both the appearance of the webpage and its functionality have been substantially improved. Additionally, a mobile version of the tool is available. The site should automatically go to the mobile version if you try to access it from a smart phone or other mobile device. The purpose of the Assessment Tool is to provide growers and consultants with a FHB risk assessment leading up to and including the all-important time of early flowering (anthesis). This is the time when fungicides targeting FHB/DON must be applied in order to be effective. The Prediction Center also includes extensive and helpful information on how to use the tool (including several important limitations), as well as information on the disease prediction models used. I have found the tool to be very useful and mostly accurate. It is important to note that the tool does not address events after anthesis that impact FHB and DON during grain development. The developers of the tool specifically chose to exclude this period because fungicides applied after anthesis will not control either FHB or DON. In other words, the FHB Assessment Tool is to be used as a fungicide decision aid and not a final outcome predictive tool. If you are interested in signing up for text and/or email alerts for specific states and/or regions of the country, go to http://www.scabusa.org/fhb_alert.php and sign up. Refuge Requirements for Transgenic Insect Control Traits in Field Corn. 2013 is one of those transitional years for changes in refuge requirements for transgenic control traits in field corn. Several changes have been made over the last several years and one can expect for changes to continue as we (likely) move away from large structural refuges and toward refuge in a bag. Generally the % of refuge seed (those seed without transgenic insect control traits) has dropped from 20% to 10% or even 5% depending upon the traits included and the company. In addition those products that require separate structural refuges (usually as blocks or a series of rows) is giving way to the inclusion of not traited seed within the bag of traited seed; the so called refuge in a bag (RIB). The result is a somewhat confusing situation where products are available that contain different refuge requirements. Obtaining the desired corn genetics which contains the correct transgenic traits to control the likely pests and planting this with the correct refuge in the proper location can be very confusing. If you follow the link: http://pest.ca.uky.edu/EXT/Recs/ENT16-Field%20corn.pdf , it will take you to ENT-16, the 2013 Insecticide Recommendations for Corn. On pages 6 and 7 of this publication you will find a Bt Trait Table that list the various packages of transgenic insect control traits by trade name, insect toxins, and the event used to include the toxins in the corn plant. This table also includes relative ratings for how well these toxin packages works against the most common and important insect pests of field corn in Kentucky. Additionally, the type (block vs RIB) of refuge and the percent of non-traited seed required to be in the refuge. In Kentucky producers can expect their greatest and most consistent return on investment from protection against European corn borer (ECB) and southwestern corn borer (SWCB). Traits for control of western corn rootworm (WCRW) are not needed nor recommended in corn fields that are rotated with non-corn crops. Corn that is not rotated (continuous corn) should be planted with products that contain more than one or “stacked” western corn rootworm (WCRW) traits. In any case products containing only the Cry3Bb1 corn rootworm toxin should not be planted in non-rotated corn. Though not yet noted in Kentucky, this is the trait for which resistance has been show in several states to our north. So far this has only occurred in corn planted in the same field for three successive years and using only the Cry3Bb1 trait for protection against western corn rootworm. Black cutworm (BCW), corn earworm (CEW) and fall armyworm (FAW) infestations are very much dependent on the growing year. Very early planting may benefit from BCW traits while very late plantings will likely benefit from control of corn earworm and fall armyworm.